Click here to download our recommended QR code reader to listen to the words on the Linguacious® flashcards. The round: Shuffle all cards in the deck and then place deck on the table, with images facing up. First player draws the card from the top of the deck and places it on the table, for all to see. First player must then scan the QR code to hear the pronunciation and must correctly repeat the word. Other players take turns repeating the word. The next player draws another card and places it next to the last card drawn. Player then scans the QR code for the new card only, and must correctly pronounce the word for the new card, plus for any other cards previously drawn. One after another, the other players must correctly name the cards. During the game, players take turns drawing cards and repeating the names for the entire sequence of cards. Ending the game: When a player cannot remember the word for one of the cards, that player loses a point. Players start a new round using the cards still left in the deck. The player who loses the most points is declared the student. Pointing Fingers (or "Pick the card"
Lay several cards down with images facing up or down. Pronounce the word for one of the images and child must point at tor pick up he associated card to get a reward. If the parent does not speak the language, the audio for a word can be played from the Linguacious® website | Our Flashcards -> Animals (audio). Video shows example of the Linguacious® cards face down with a child at 16 months of age learning Brazilian Portuguese (since child is not yet learning to read/write and one of the parents is a native speaker of Portuguese, cards in any language can be used). * we recommend using a topload card protector like the one in the video to protect the cards when used with children under 3 years of age (toploader must be bought separately). Game 3: It's all behind us now! Lay all (or just a few) cards down with the same or different sides up (front or back). One player at a time has to guess the other side of a selected card (players agree at start of game on whether they will focus on pronunciation, meaning, or spelling for that round). Players may select their own cards or may agree to select cards for each other, to make it more difficult and interesting. If a player guesses the other side correctly, they get to keep that card. If they guess it wrong, they must return the card to the same initial position. Once there are no more cards left down, the player with the most cards wins. When guessing the front of the card, the translation of the word in the 1st language may serve as evidence of meaning acquisition. PS: Players must agree at the start of the game whether it’s OK to also scan the QR code on the back of a card when trying to guess the front of the card. For some languages that do not use the Latin alphabet (languages such as Korean, Japanese, Russian, Hebrew, and so on), it may be a good idea to test knowledge of listening separately. Lay cards on the table with images facing up or down. Taking turns, players must correctly guess the other side of two cards of same suit shape or suit color in order to keep the two cards. If they guess either of the two cards wrong, they must return both cards to the table. The next player goes. Once it is no longer possible to guess two cards of same suit shape or same suit color, players guess only one card at a time, always checking their answers. Once there are no cards left, the player with the most cards at the end wins. If your specific cards have no suits (such as in our Shapes, Colors, and Numbers deck), you can use the shape or color, for example, as a common element instead. Watch out for the Thief! One of the players becomes the designated dealer and shuffles all available cards. The youngest player always plays first on the first round. In subsequent rounds, the winner of the previous round goes first. Other players go in clockwise fashion from the first player. In this order, each player takes 2 cards at the start of the game from the bottom of the shuffled deck. Only the player taking the cards should see the cards. Each player decides which side of each of their cards will be facing other players when cards are held up (the idea is to make it hard for other players to guess the side that is facing you!). All other cards that were not distributed will be placed in a pile called the Linguacious® pile. Example of two different players holding their cards during game #5 (Watch Out for the Thief!). 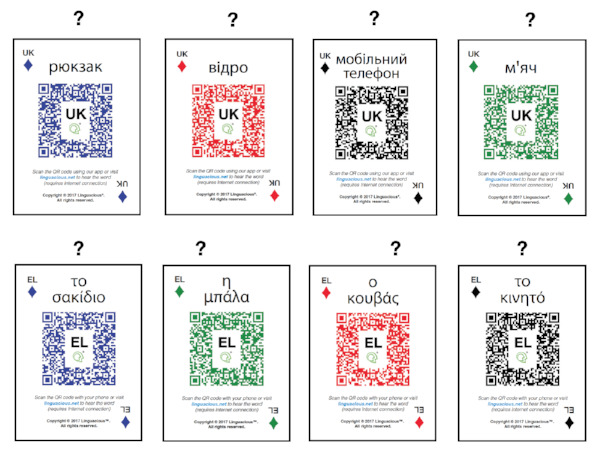 Players depicted here are playing a polyglot version of the game (more than one language at the same time, with the code for each language showing at the top left of each card). The objective of the game is for players to earn points by putting down a set of three or more cards with the same suit (hearts, diamonds, clubs, or spades) or same suit color (red, blue, green, or black) at the end of their turn. If your specific cards have no suits (such as in our Shapes, Colors, and Numbers deck), you can use the shape or color, for example, as a common element instead. A set with three cards is worth 5 points, one with 4 cards worth 10 points, and one with 5 worth 15 points, and so on. Any cards the players still have on their hands once the game is over is worth 1 point. 1- During a player’s turn, he/she can either try to guess the other side of one of the cards of any other player (the specific card must be touched before the guessing occurs), or he/she can try to guess the other side of the card at the top of the Linguacious® pile. If they manage to correctly guess the other side, they keep that card (every time a player adds a card to their hand they can choose which side they want to face other players). If the current player fails to correctly guess the other side of the card, they must donate one of their own cards either to the person they guessed from (in case they guessed from another player) or to the bottom of the Linguacious® pile (in case they tried to guess the card at the top the pile). 2- The player may now put down any set of cards they have (3 or more of same suit shape or same suit color). 3- At the end of the current player’s turn, every player who has less than 2 cards in their hands must draw from the bottom of the pile until they have two cards in their hand, starting from the current player (players choose which side of the new cards will face other players). Players may reshuffle the position of the cards in their hands in they want to. 4- Next player goes and steps 1-3 repeat. The game is declared over when there are no more cards in the bank and no more possible sets among the cards still being played. At this point, points are added up based on the sets that players put down during the game and on the cards still left in each player’s hands. Sets of three are worth 5 points, sets of four are worth 10 points, and sets of five are worth 15 points. Each card in the hand is worth 1 point. The winner of the round is the player with the most points at the end of the game. One of the players becomes the designated dealer and shuffles all available cards. Then, he or she randomly selects 9 cards from the deck and lays them down in a 3 x 3 matrix (see image to the left). To correctly guess three cards in a line (vertical, horizontal, or diagonal). One player at a time selects a card in the matrix and tries to guess the other side of the card. If they correctly guess it, they may place a piece of paper or some other object on that card to mark it as their own. The next player goes. Once a player has marked three cards in a line (see image of the left), that player is declared the winner of that round. Those 9 cards are put aside and the rest of the cards are reshuffled for a new game. The player who lost the last round goes first in the new round. Game 7: Printable Vocabulary Bingo! Each player will receive a 5 x 5 bingo board (link above) with 24 words randomly drawn from one of the Linguacious® flashcard decks. Once ever player/student has their own bingo card, a designated dealer will shuffle all the cards in the deck. The shuffled cards should be placed in a pile on the table, with the back of the cards facing up (i.e., the side that does NOT contain the image). One at a time, the dealer will draw a random card from the bottom of the deck. If practicing writing/spelling, the dealer will simply show the symbol or writing for that word to all players. If practicing listening, the dealer should simply scan the QR code for all players to listen. Players who believe they have that specific word in their bingo card can mark that square in their bingo card (players may hide their cards from each other). The dealer then puts that card away in a "played cards pile". Once a player has marked five squares in a straight line (vertical, horizontal, or diagonal), they can call "Bingo!". Then, the dealer checks if all cards that have been marked have indeed been drawn. If so, that player is declared the winner of that round. If not, the games continues until another player has a correct Bingo. This game is about being super creative while also practicing the words from the Linguacious® cards. Shuffle all available cards and place them in a pile, with images facing up. "On a given Sunday morning, Jack woke up only to realize that his room was full of mariquitas" (‘ladybug’ in Spanish). “Jack was so surprised to see his room full of mariquitas that he suddenly let out a roar, just like a león" ('lion' in Spanish). This Linguacious®version of Snakes and Ladders below requires players to have already mastered the majority of the 52 words in our Around the Home flashcards and serves to reinforce knowledge of the words through repetition and fun! All 52 words can be found here on this Snakes and Ladders board. Click here to download the board for printing. This Linguacious®version of Snakes and Ladders below requires players to have already mastered the majority of the 52 words in our Animals flashcards and serves to reinforce knowledge of the words through repetition and fun! All 52 words can be found here on this Snakes and Ladders board. Click here to download the board for printing. Each player puts their counters (can be anything) on the space that says 'START'. Players take turns to roll the dice. Move your counter forward the number of spaces shown on the dice IF and ONLY IF you are able to say the name of the animal/object shown in that specific square or if the square does not contain an animal/object image. If you cannot say the name of the animal/object, you must remain in the square where you were before you rolled the dice, but you can check the right answer either using your Linguacious® flashcards or by checking another source. The first player to get to space #100 is the winner! Game 10: Bilingual Memory Game! Lay the cards from both decks down, with images facing down. You may use the entire two decks (104 cards in all) for players already familiar with most words, or start with a smaller number of cards from each deck (as long as the cards you choose refer to the same images). Youngest player goes first. Player must choose any card they want and has to say out loud (guessing is allowed) what the word refers to in English. If they want, they may first scan the QR code with the Linguacious app to listen to the word pronounced by a native speaker. They then flip the card over to expose the image and to confirm if they were right. If they got it right, they now have the chance to flip a second card on the table that they believe has the same image on the other side. If they got it wrong, they return the card to the initial position (image down) and pass the turn to another player, who will repeat the steps above and try to match two cards. If they guessed the first card right but flipped a wrong match for the second card, they must also return both cards to their initial positions (image down) and pass the turn to the next player. For every two cards a player manages to match, they get to keep the two cards by their side. When there are no cards left, players count how many cards they have managed to collect by their side. The player with the largest number of cards is declared the bilingual memory master. Game 11: Let’s Sort This Out! Photo courtesy of blog For the Love of Spanish. The sorting games that can be played with the Linguacious® flashcards to practice the words are endless. The words in each deck can be divided into different groups according to their sounds, letters, uses, colors, likes and dislikes, and much more, all the while practicing the words and reinforcing their knowledge. For some creative ideas of how to go about it, check out this review of our flashcards.